Even though Mom just made these for St. Joseph's Day and Christmas, this dessert is great any time of the year. The crusty pastry filled with custard was so good I could never resist waiting for them to cool down before I would eat at least a half a dozen of them. Instead of the traditional custard filling for these puffs you can try them with a chocolate cannoli cream filling instead. Finish them off with a dusting of powdered sugar and your ready for a party. In a saucepan bring the water, salt and the butter to a boil. Stir in the flour until it forms a ball. Transfer the dough to a bowl and mix in one egg at a time until well blended. Using a tablespoon drop dollops of dough onto a cookie sheet and bake for 20 to 25 minute until puffs are golden brown and the inside is dry. Let the puffs cool down before filling. Mix together the cream, milk and instant custard and chill until firm. Cut the Cream Puffs in half and fill with custard. Put the tops back on and dust with powdered sugar. Using a mixer or a food processor, blend together the ricotta, sugar, vanilla and melted chocolate until smooth. 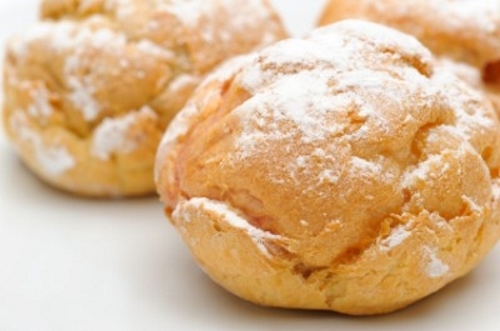 This recipe should make 3 dozen Cream Puffs.